The closing date for submissions to the 2014 TWAN contest is approaching. Its on the April 22, the Earth Day. If you have created exceptional earth and sky images since Jan. 2013, this is the last call for submissions to this year's contest. Considered as the world's leading international photo contest for nightscape (night sky over landscapes) images, it is open and free to both professional and amateur photographers at any age anywhere in the world. The Earth & Sky Contest is a non-profit and a non-commercial effort to highlight the beauty and importance of night sky, its connection with our life, and the issue of light pollution. For submissions please follow the guidelines on twanight.org/contest. 1- Canon EOS60Da camera body, sponsored by Woodland Hills Camera & Telescope, a major provider of astronomical and photography equipment in the United States. The 60Da is a DSLR camera specifically made for night sky photography. The camera has a low-noise sensor and a modified infrared filter for improved capture of red hydrogen emission nebulae. It is three times as sensitive to H-alpha light as the 60D allowing for richer, colorful and sharper shots of nebulae. 2- Polarie Star Tracker (complete set) by Vixen, including the tracking mount, the special tripod and ball heads, the polar scope, and the Polar Meter. Used by many of TWAN photographers, Polarie is a smart mount for DSLR cameras, an easy to run and ultra-compact mount to track the stars for nightscapes or deep sky photography using just a camera and a lens. On this video learn more about Polarie and its various use in nightscape photography. There are other prizes for the 3rd to 5th winners at each category. Astronomik, the manufacturer of finest astronomical filters offered total of $1000 gift certificates for the winners. Astronomik is known for the clip-filters for Canon DSLR cameras (such as light pollution filter) which is now available for full frame cameras too, and large front lens filters for all other camera brands. The OPT Telescopes, one of the world's best known astronomical equipment provider, has offered a 6-inch Ritchey-Chretien Astrograph, a compact telescope tube that produce flat, sharp images with virtually no false color or coma. Explore Scientific, a manufacturer of astronomical equipment, known for innovative ultra wide field eyepieces, has also offered prizes for the contest. Vixen Europe (in Germany) has supported the contest with two ATREK Light 6x30 binoculars for widefield stargazing and nature viewing. Starizona, Arizona-based manufacturer of fine astronomical accessories such as Hyperstar Lenses for telescopic astrophotography, has offered a 4.5-inch Dobsonian telescope for a contest winner. 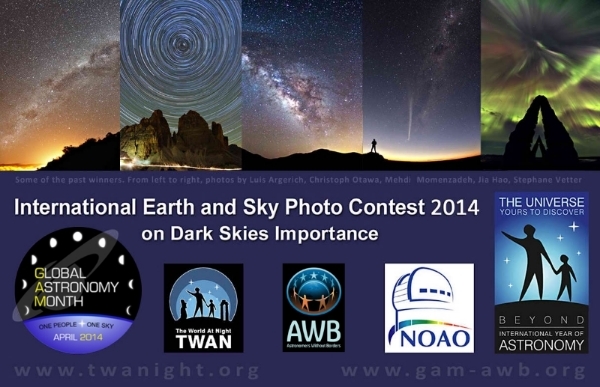 Sky & Telescope, the world's most respected astronomy magazine, supports the contest with prizes as well.